France Atlanta 2014 is a month-long series of scientific symposiums, business workshops, culturally- and humanitarian-focused events organized by France’s consulate general. The International Associated Laboratory (IAL) was established in 2013 between Winship, Georgia’s only National Cancer Institute-designated cancer center, and Inserm, the pre-eminent biomedical and public health research institution of France. The IAL alliance springs from a professional relationship started several years ago between Winship's Jacques Galipeau, MD, a world-renowned expert in regenerative medicine, and Luc Sensébé, PhD, director of Inserm’s StromaLab center in Toulouse, France. In 2013, the two institutions signed a letter of intent to establish the IAL, formalizing the cooperation. The new laboratory provides opportunities of exchange for students from the two labs and will also accelerate research in developing clinical therapies. This is the fifth year of France Atlanta 2014. Kick-off events include an opening ceremony at the Besharat Gallery in Castleberry Hill, a photo exhibit and a two-day program titled “Drones and Autonomous Aviation: Innovation, Markets and Regulations,” to be held at the Aerospace Systems Design Laboratory at the Georgia Institute of Technology. The workshop brings together some of the top specialists in the field from Georgia Tech’s College of Engineering and Research Institute, University of South Carolina, Adaptive Flight, Inc., Georgia Tech Lorraine, ONERA, the French Aerospace Lab (ENAC), the French Civil Aviation University (ISAE) and University of Lorraine. France Atlanta 2014 will also feature a series of presentations about humanitarian issues to students of French at participating metro Atlanta schools and universities, and cultural events such as a performance of the contemporary dance group, “Je suis, I am,” a collaboration of the Atlanta-based CORE Performance Co. and Association Manifeste. For a full listing of all the programs, visit the France-Atlanta website. 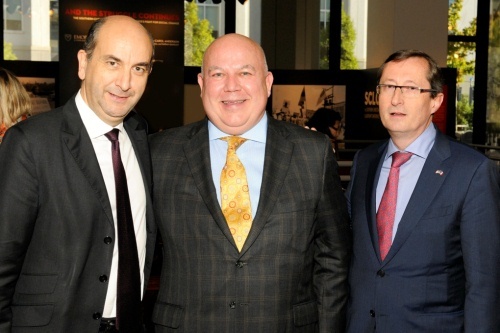 Pictured: Frédéric Doré, Minister-Counsellor and Deputy Chief of Mission of the Embassy of France to the US, Dr. Jacques Galipeau, Professor of Hematology and Medical Oncology at Emory University School of Medicine and Denis Barbet, Consul Général of France in Atlanta.